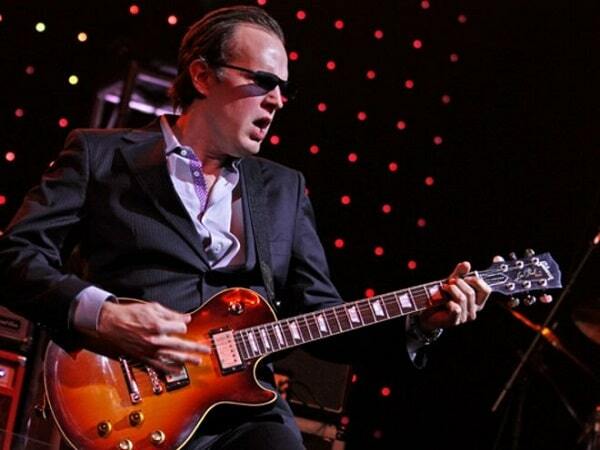 For nearly two decades, Joe Bonamassa has been one of the top blues guitarist/vocalists of Generation Y, but also a favorite of preceding generations that just love a guitar hero. Openly acknowledging the influence of such 1960s British blues icons as Rory Gallagher and Paul Kossoff, Bonamassa has occasionally strayed from his roots, most notably with now-defunct rockers Black Country Communion and with vocalist Beth Hart. But on his new album, Different Shades of Blue, which drops in mid-September, Bonamassa returns to his blues/rock roots in an unexpected way, collaborating with Nashville songwriters and giving them a chance to stretch beyond the boundaries of what they do for a living in the modern country music industry. Your new album has collaborations with Nashville writers like Jeffrey Steele and James House. Did you already know these guys, or did you just decide to hook up with some full-time writers and see what you could come up with? I knew Jonathan Cain, I knew Jerry Flowers, I’d met James House…I didn’t know Jeffrey Steele or Gary Nicholson until I got there. But they’re all really nice cats. I was unfamiliar with Jeffrey Steele’s work until I walked into his writing room and saw like a gazillion gold records. Clearly this guy has the knack for the hit song. He’s a funky cat, a really deep, soulful writer. But I could sense the relief when I walked into the rooms with these writers and they said, “Whaddaya wanna do?” and I said, “Let’s write some blues, I don’t care if it’s six minutes long,” because I don’t do the hit-driven model. I could sense this relief on everybody’s face, because they didn’t have to worry about these songs sounding like the other stuff on the radio. Because these guys are best known for songs that are three minutes and 10 seconds. Yeah, and sometimes my guitar solos are three minutes and 10 seconds. Like my solo on “Oh Beautiful!” (from the new album). Did you do all this writing face to face, or did you do some Skyping? No, it was all face to face. I don’t like that (Skyping). How long did it take to write these songs? I was in Nashville five separate times last year. So since you wrote in Nashville, and bluesmen like James Cotton and Joe Louis Walker have been cutting in Nashville, why did you decide to track in Las Vegas? I like Vegas, and it’s easy to get my gear there. It’s a five-hour ride from my house. And I took $400 out of a slot machine. You can’t do that in Nashville. But Nashville has called my name for many years. There are a lot of good musicians running around there. Moreso than L.A., where I meet a lot of ’80s throwback poser types pretending they’re rock stars when they aren’t. On the new record you use a lot of vintage guitars and you list them all in the CD liner notes. I hadn’t realized you were such a collector. I have a bunch of guitars, too many to list. I tend to write on the guitars that I intend to use on the song. For me it’s Les Paul, Tele…335, Strat. I use all old guitars. It’s not a bad gathering of stuff. You and Beth Hart are both writers, but on the two albums you’ve done together you chose to record strictly covers. Some great songs, of course, written by people like Tom Waits and Brook Benton, but what was the thinking behind this? If you listen to something like (the Rolling Stones’) Get Yer Ya Ya’s Out, with Ike and Tina Turner doing the opening set, they’re doing Beatles covers, CCR…so the only theory of Beth and I working together was never to write together, it was about finding a great songbook and doing those songs with a killer band and letting Beth do her thing. We actually ended up doing “Nutbush City Limits” by Ike and Tina on the last record. Some people who picked up those records, though, might have done so to hear you shred, which was not what that music was about. You have to play the kind of music that you’re playing to. In other words, there’s some guitars players that really will force their will on everything. If it’s a Billie Holiday song they’ll bring in a Marshall amp and a Les Paul and put rock tones on a Billie Holiday song. You can’t do that. You have play in respect to the music that you’re playing. That’s why the (guitar) collection is what it is, because it’s like having a tool kit. If you need an old-timey Hubert Sumlin kind of tone, it helps if you have the same kind of guitar and amp Hubert played on those great Howlin’ Wolf records. The same goes for the Beth stuff. Your influences – Gallagher, Kossoff, Clapton – are well known. But as you get older, are there any new people that you hear who are creeping into your style at all? (The late Nashville session legend) Hank Garland has been a huge influence in the last six months. I’m more into the players that have come before me…my friend who passed on, the great guitar player Danny Gatton, turned me on to Hank Garland. And being a guitar collector I know the story of how Hank Garland and Billy Byrd helped come up with the Byrdland for Gibson. It’s been a while but I rediscovered his catalog. He played on things like (Elvis Presley’s) “Little Sister,” but he made a couple albums of his own that were just straight jazz that were like, man, you couldn’t beat them. Are you going to be touring right away to promote the new record? We always tour whether there’s a new record or not. Yes, until the end of the year. Looking ahead, what do you have planned for the next record after Different Shades of Blue? Ummm…(long pause) Oh yeah, we’re going to record in Nashville! At Jonathan Cain’s studio. And Nashville will never be the same.